Denver Westies is dedicated to building the West Coast Swing Dance community in Denver, Colorado. For the most up-to-date information on all of the dance events, social activities, and other info, find us on Facebook at Denver Westies. The best night of West Coast Swing dancing in all of Colorado happens every Wednesday night, downtown Denver at the Mercury Cafe. 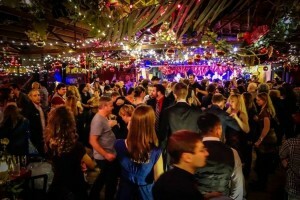 The Mercury Cafe is a colorful venue with a restaurant, full bar and spacious dance floor and is located at 2199 California St, Denver, CO 80205. Denver Westies hosts a weekly dance every Wednesday night, downtown at The Mercury Cafe. This is THE place to go for West Coast Swing Dancing in the Denver area. Our very own All-Star instructors, Haider Khan and Aly Yorek, teach the intermediate lessons each week. If you’re new to West Coast Swing or dancing in general, then come try the beginner lesson with Dani Botello and Derek Newman. No partner necessary. The vast majority of dancers do not show up with a partner. The beginner lesson is included in the dance, so afterwards you can dance the night away. Please be sure to check the Denver Westies Facebook page for more information and other events.